As per EMA guideline AUC(0-t) should cover at least 80% of AUC(0-∞) but in one of my study I have got this percentage more than 20% and the % in the study is around 31%. Is there any way by which I can justify this issue? Anybody has any such experience with the European regulators’? Your views are highly appreciated. "As stated in section 4.1.4, AUC(0-t) should cover at least 80% of AUC(0-∞). Subjects should not be excluded from the statistical analysis if AUC(0-t) covers less than 80% of AUC(0-∞), but if the percentage is less than 80% in more than 20% of the observations then the validity of the study may need to be discussed." I interpret the 20% of observations as 20% of AUC values i.e. 2xsubjects in a classical 2x2x2 crossover. Don't ask me how the validity of the study may be discussed. Duno. Yes, in more than 20% of observations AUCinf has been extrapolated for more than 20% and i have received a query from EMA to discuss the validity of the study. I am just thinking what all points should be considered for the justification and further is there any way by which it can be justified? » Yes, in more than 20% of observations AUCinf has been extrapolated for more than 20% and i have received a query from EMA to discuss the validity of the study. From EMA? I guess you mean from one or more of the national agencies? » I am just thinking what all points should be considered for the justification and further is there any way by which it can be justified? Try and tell why this happened in the first place. If it was not intended then I guess your study could be argued to be slightly badly planned for which there are no obvious and acceptable excuses. On the other hand if you deliberately shortened sampling time for some reason (PI opinion, ethics, ADME-tox properties) then please give a little further info and let's see. » […] if you deliberately shortened sampling time for some reason (PI opinion, ethics, ADME-tox properties) then please give a little further info and let's see. No sure what you mean by ↑ that. Shortening the sampling wouldn’t help. » No sure what you mean by ↑ that. Shortening the sampling wouldn’t help. Sorry, this was a dumb formulation, you are absolutely right. If the tox properties are unfavourable then one might need to dose so low that the drug is adme'd away by the time one for some reason or other would like to measure. Erm... Heh... even this sounds dumb now. Does bebac offer language courses? PS: I don't mean to indicate this would be an excuse in itself, rather it could be a cause. » Does bebac offer language courses? Depends. I’m far from being competent in standard German although I could offer counseling in its Austrian variant. The only language I really master is Viennese. Are you interested? Free lodging included. Visiting my favorite Heurigen mandatory. » Austrian German is a funny kind of Mickey Mouse language. I like the sound of it. Yep. For me it’s always amazing that native speakers of English love the Austrian’s accent whereas they hate the Kraut’s. Both sound awful to me. » […] I converted to the Vegetophysticiologists. We only drink cabbage juice and eat mung beans. Go to Gujarat. Next step Breatharianism. This is interesting topic as I too have had similar situation where in the ratio of AUC0-t / AUC0-inf was less than 80% in several cases. The ratios were fine with the Ln transformed data. ratio = difference of logs! » The ratios were fine with the Ln transformed data. AUCt 375, AUC∞ 500, covered: 100×375/500=75%. lnAUCt 5.9269, lnAUC∞ 6.2146, covered: 100×ℯ5.9269–6.2146=75%. A ratio of logs (95.37%) is nonsense. 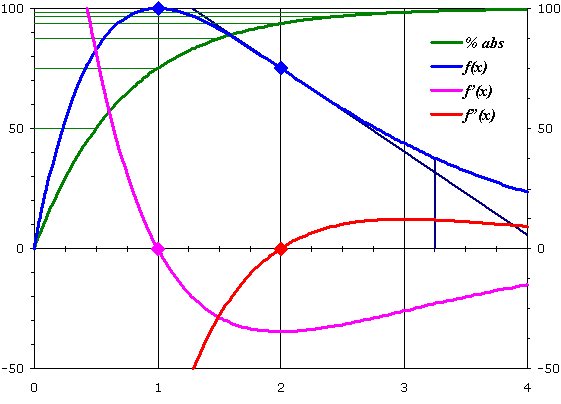 ƒ(x) = A(ℯ–kel·x – ℯ–ka·x). ƒ”(x) = A(kel²·ℯ–kel·x – ka²·ℯ–ka·x). Example: A 400, ka 1.3863 (t½a 0.5), kel 0.6931 (t½el 1). Although Scheerans et al. recom­mended their procedure for ka ≥ 3kel in order to avoid problems with flip-flop PK (which is unlikely for IR formulations) I used a ratio of 2 in order to get nice numbers. At tmax 75% are absorbed (AUCt/AUC∞ 25%) and at tinpt already 93.75% (AUCt/AUC∞ 56.25%). When do we have a ratio of 80%? At 3.244 (where 98.89% are absorbed). That’s a very, very conservative value. Note that tinpt equals four absorption half-lives (alternative method for the calculation of % absorbed: 100 – 100/24·t½a = 93.75%). If one wants to be more conservative and follow the logic of the GL (wash-out, saturation to steady state) and use five half-lives one could stop at 2.5. So why a cut-off of 80%? * Since tinpt is a reasonable starting point for the estimation of λz (forget max. R²adj including earlier time points since elimination is contaminated by absorption) it should be possible to have ≥3 data points in the interval [tinpt, tlast]. We can expect to get a reliable estimate of λz. But what’s the use of it? EMA’s metric for extent of absorption is AUCt. We could reliably estimate it with an earlier cut-off as well!2 Are we comparing λz of test and reference? No. On the contrary – we assume identical inter-occasion clearances (or V + kel if you belong to the other church). IMHO the cut-off of 80% is scientifically not justified for monoexponential models (including ones with a lag-time: homework). Would only make sense if we would use AUCs corrected by kel,3 which seems not to be acceptable by EMA (at least). It’s strange to judge the validity of a study based on eli­mi­na­tion rather than essentially complete absorption. Unfortunately it is not that easy for multicompartimental models – or even worse – profiles with multiple peaks, though absorption will follow the same time course. MR (CR in particular) is another pot of tea. We might be in flip-flop limbo and personally I would not use AUCt as the main metric at all. I’m curious what the draft MR GL will tell us… I would suggest AUC∞ with an extrapolated area of well below 20%. @Ratnakar: If you want help it would be a good idea to answer all of the questions in my previous post (see the Forum’s policy). Note that the FDA – although both AUCt and AUC∞ are required – doesn’t have such a cut-off. How did you justify the clarification? How can it be justified that the extrapolated AUC is greater than 20%?